Family fun in Clearwater. Opens in a new window. Sun, sand, and seafood. Opens in a new window. Maxing out on St. Petersburg museums. Opens in a new window. We were placed in an "upgraded" room, which meant we didn't get the one bedroom with a view of the bay. We got a second floor room in the tree tops, on a busy street with no sunshine coming in. Staff was initially very unhelpful, I contacted Expedia and after they talked with you we were offered a different room which was much nicer. Everyone was super friendly and helpful especially at the restaurant. Where to find Madeira Beach hotels near an airport? Where can I find hotels in Madeira Beach that are near tourist attractions? Should you be searching for great places to base yourself in Madeira Beach, you're simply spoiled for choice. For those wanting to stay within a 0.1-kilometre (0.1-mile) distance of central Madeira Beach, Expedia's up-to-date database lists at least 105 places to stay in that area. Looking for a place to stay near to the heart of Madeira Beach? 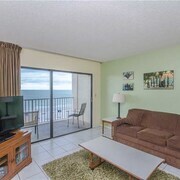 The Seabreeze Condominiums and Barefoot Beach Hotel will suit your needs. The Residence Inn St Petersburg Treasure Island and Sunset Vistas Two Bedroom Beachfront Suites are nearest to Hubbards Marina. Alternatively, if the Alligator Attraction is why you are coming to Madeira Beach, the Westwinds Waterfront Resort and Surf Beach Resort are the closest options. 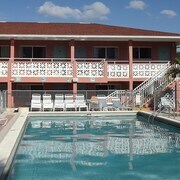 The Sandpearl Resort is located 20 kilometres (12 miles) from downtown Madeira Beach. 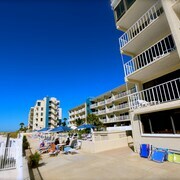 Another hotel is the Hyatt Regency Clearwater Beach Resort & Spa, which is positioned 19 kilometres (12 miles) away. 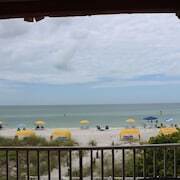 The Don CeSar and also the Clearwater Beach Marriott Suites on Sand Key are some other Expedia-listed hotels around Madeira Beach. The broader Tampa Bay region is definitely worth visiting also. Visit Tampa Bay's lighthouses or enjoy its beaches. In this section of United States of America, travelers can enjoy hiking. Looking for more things to do? Consider spending a few hours discovering the Panama Canal Museum and Treasure Island Fun Center in Oakhurst, 3 kilometres (2 miles) to the north of Madeira Beach. The DoubleTree Beach Resort by Hilton Tampa Bay-North Redington and Madeira Bay Resort & Spa are just some of the Expedia-recommended hotel options in Oakhurst. 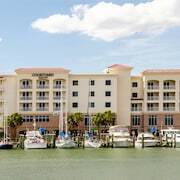 Or, you could stay in Seminole, 5 kilometres (3 miles) to the north of Madeira Beach, where you can choose from the Hotel Sol and Boca Ciega Resort. Regardless of whether you're passing through or spending a few nights in Seminole, be sure to visit Lake Seminole Park and the Tides Golf Club. Clearwater is positioned 18 kilometres (11 miles) from Madeira Beach. While you are in the region, you may wish to investigate the Clearwater Marine Aquarium, Church of Scientology and Coachman Park. The Harborview Center and the Landings Golf Club are also worth visiting. Clearwater has places to stay to suit all budgets and tastes, including the Residence Inn By Marriott St Petersburg Clearwater and Comfort Suites Clearwater - Dunedin. Situated 14 kilometres (9 miles) away from Madeira Beach is St. Petersburg-Clearwater International Airport. Stay nearby at St. Petersburg Marriott Clearwater or Hilton St. Petersburg Carillon Park. Paradise isn’t just a buzzword in this beach town. The streets here are almost completely devoid of commercial and industrial buildings. The city consists of residential communities and unobtrusive hotels and resorts. It’s the kind of place where you can truly escape from the distractions and complications of modern life. Of course, hotels on Madeira Beach, FL offer all the modern pleasures and conveniences you need to have an enjoyable holiday. This coastal gem enjoys 241 sunny days per year. Temperatures in July and August often reach 32 degrees Celsius. While the rest of the country is experiencing frost in January, residents of Madeira Beach are talking long walks on the beach in the comfort of temperatures reaching 16 degrees Celsius. The weather throughout the year ranges from warm to hot. It’s so easy to find a great Madeira Beach hotel whenever you can squeeze a little time away from home into your schedule. Of course, the beach is the primary attraction here. White sand and breathtaking sunsets will bring a smile to your face each day. Enjoy snack vendors, water sports, and a little shopping near the sand. Take time to visit the Alligator Attraction, John's Pass Village and Boardwalk, and Hubbard's Marina. Several agencies offer boating excursions to watch for dolphins. You’ll really want to be on the lookout for our amazing discounts at top hotels. Stick around for exclusive offers to help you stick to your budget at the beach. 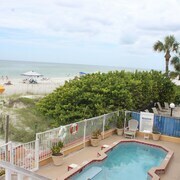 Are you excited to reserve the best rates at hotels near Madeira Beach Florida? Book a cheap room using our exclusive all-inclusive packages while there's still time. You simply won’t find an easier way to squeeze overnight accommodations and Madeira Beach flight deals into your budget. Forget about searching under every last beach blanket for special offers. We promise the guaranteed lowest price to every great destination you can dream of. Shake off your beach blanket and plan a holiday in the sun on Expedia.ca today. What are the most popular Madeira Beach hotels? Location! Location! Location!!! 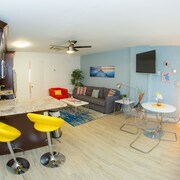 1BR Apt Just a Block From the Sand! 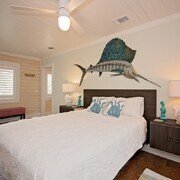 Spacious Two-level Condo With Fishing, Pools, and Easy Access to the Beach. Affordable! Are there hotels in other cities near Madeira Beach? 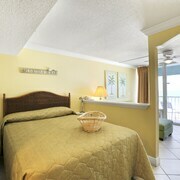 What other types of accommodations are available in Madeira Beach? Explore Madeira Beach with Expedia.ca’s Travel Guides to find the best flights, cars, holiday packages and more!